These large concrete planters offer maximum durability and minimum maintenance. The rugged steel reinforced construction and thick concrete walls make these planters the ideal solution for perimeter security. Ideal for planting large shrubs or small trees, concrete planters can support more weight than resin or plastic planters. Planters are available in multiple sizes to fit any location. 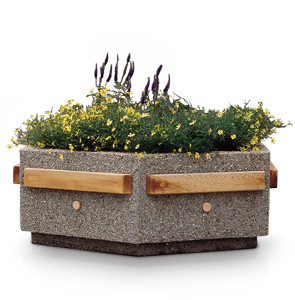 The various concrete colors and finish options are complemented by either Douglas Fir or Cedar wood trim accents on all six sides of the planter. All planters come standard with drain holes for proper drainage.